The Second Edition of this handbook provides comprehensive coverage of the concept of accessibility and its application to the design and implementation of instruction and tests with all students. It updates and expands on its original contents and responds to the increasing demand for research-based evidence of accessible instruction and testing practices from the professional community. Chapters explore how outcomes are affected when essential features or components of instructional materials and tests are not accessible to any portion of the student population. The handbook addresses the new set of Standards for Educational and Psychological Testing that was published in 2014 as well as requirements for a high level of access for all interim and summative tests by national testing consortiums. In addition, the handbook describes how the Center for Applied Special Technology (CAST) has continued to advance Universal Design for Learning (UDL) principles in mainstream education with teachers of all types of students, not just students with disabilities. A summary of U.S. policies that support inclusive assessment for students with disabilities. An overview of international policies that support inclusive assessments. Designing, developing, and implementing an accessible computer-based national assessment system. Universal Design for Learning (UDL) principles and the future of assessment. Recent advancements in the accessibility of digitally delivered educational assessments. 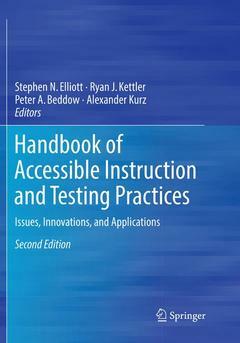 The Handbook of Accessible Instruction and Testing Practices, Second Edition is an essential reference for researchers, practitioners, and graduate students in education and allied disciplines, including child and school psychology; assessment, testing and evaluation; social work; and education policy and politics.